In keeping with this summer’s St. Germain theme, tonight we had a drink called “The Mistress”. It’s vodka (we used Stoli, natch), St. Germain, basil, and fresh squeezed lime. A very nice cocktail–a little herbish, but not too. We’ll be trying to replicate this at home, and soon. That’s right. I said “camping.” We at the P & P Drinking Company participate in an annual camping outing with friends. (Stop laughing.) Whilst on said camping trip, we discovered that Zubrowka and apple juice fit the scene just right. For those not in-the-know, Zubrowka is a Polish bison grass vodka. We brought ours back from Poland, but it is available in the US (sometimes marketed as “Zu”). Just look for the vodka with the bison on the label and the long piece of grass in it, and you’ve got the right one. Crisp and refreshing….thirst-quenching enough for the warm days, but still snappy enough for the cool mountain nights…..
At Sampan in Philadelphia, they have what they refer to as “scorpion bowls”….big alcoholic fishbowls to be shared. If you ask nicely, they will serve those drinks as single cocktails. 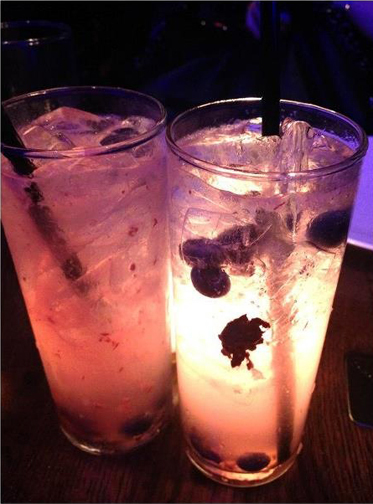 For summer, they have a “blueberry lemonade”, which contains citrus vodka, Meyer lemon juice, and blueberries. It’s a rather lovely combo…. next time, we’ll get the fishbowl. It’s hard to go wrong with Stoli Vanil, Three Olives Rangtang, and tonic. Previously, we’ve posted about our attempts to duplicate the Lucky Cat cocktail from P. F. Chang’s. Last night, we sampled the Coconut Lemon Sour. Pearl coconut vodka, coconut water, lemon juice, and simple syrup. Smoooth! Sometimes, there’s something to the “hive mind” concept….that our collective conscious leads us in the same direction at the same time through independent paths, like Mr. Bell and Mr. Gray both patenting electrical speech machines at the same time. Two weeks ago, we posted about the proliferation of the cherry-lime flavor combination. Then, we posted about St. Germain in white wine. Last weekend, our friend starting telling us about “the Krog”, as she & her husband have dubbed it, a drink that they had at the Krog Bar in Atlanta. And guess what’s in “the Krog”? Vinho verde (a Portuguese white) and St. Germain. Surely, more proof that great minds think alike!